For the past two weeks, I’ve been in Burgos, Spain. A place where 40,000 pilgrims walk through for the Camino de Santiago. It’s been blue skies and sunshine. But today, sitting in the living room of Casa del BienEstar, I’m surprised to see little rocks of ice are falling from the sky. I’m here in Spain because I’m looking for a place to continue in deep retreat, and dear noble friend Joserra said there could be the possibility of holding space for silence here in the expanding field of Burgos. This is exactly what Joserra and many of the Spanish volunteers anchoring the field here have been doing in Burgos - Miki, David, Arianna, Quique, Pablo and Sabine to name a few. In Burgos the seeds for a forest of gifts germinated four years ago. With Awakin circles first starting around that time. And then the first Re-love-ution weekend retreat where the likes of Mukeshbhai, Rose-Maria, Madhu and Diken blessed the emerging project with their presence. Having been to that first Re-love-ution retreat I can see the growing serendipity capital. Colleen, who has also been here the last two weeks, is offering a sacred geometry drawing session and she says to Joserra, “Ah we’ll need compasses for that. Maybe we could buy some beforehand?” “No, no we can ask the community, they’ll have some” he replies instantly. He says the same thing to me too when I mention looking for a space for long retreats. "Something will emerge". He shares a new term that he heard at the last ServiceSpace retreat: emergination. Since meeting him a few years ago I am struck more and more by his rootedness in trusting serendipity and emergence. And those seeds that have begun germinating are thriving. The garden is swiftly becoming a forest. Miki and Irene from Madrid, two heart-full volunteers made the decision to move to Villasur de Herreros in May of this year. The young couple made a choice to go against the grain - where most young people are leaving small villages to the bigger cities. Driven by different values they opted to live in this small village and fully engage with the community there. Miki helps with a small growing project that sells locally grown organic produce and also runs gifted yoga sessions weekly. 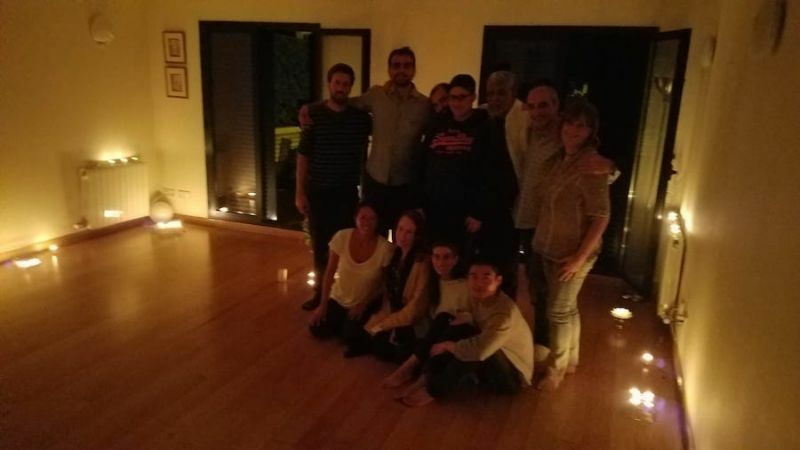 “A year ago I was in a very special retreat… it's when I started to pay an increased attention to alignment with the highest self (on different levels and topics). Since then I've been working on it with different meditations and guidelines…. And now during this very retreat (half time for me ) I received some key revelations..
From a different perspective: As this mini retreat was meant to be an inner journey, sometimes I had to struggle a bit to avoid temptation to catch your smiles or eye contact (as they all are tremendously nourishing ). It is definitely easier to be on a silent retreat with unknown souls. Lying exactly along the Camino de Santiago, where in the early morning many pilgrims can be seen walking past the house, is Casa del BienEstar, the House of Well-being. Colleen writes on the Spanish Awakin’ chat group that this evening a few of us will gather to make gifts we can give to pilgrims on Saturday morning where we planned to walk a bit of the Camino with Pavi. Arianna, one of the anchors at Casa del BienEstar, shares with me the inspiration for the name - “armonía entre la mente, el cuerpo, las emociones y la espiritualidad”, harmony between mind, body, emotions and spirituality. On the first day I arrived, it felt like walking into a temple. Joserra greeted me at the door, and I greeted back in a whisper. I was sure they were mid way through a meditation or something! But there were half a dozen happy faces sitting out in the terrace enjoying lunch. The house was offered by Sylvia as a more permanent space to foster this deeper well-being. In the last month since it’s beginning there’s been Monday Awakin’ circles, monthly women’s circles, Vipassana meditation on Thursday’s, yoga on Wednesday’s and a small Thich Nhat Hanh Sangha that meets on Tuesday’s - all this before they've even had their official inauguration! Still in the process of emergination they are working through shared values and possibly bringing in certain creative constraints for the space. In Casa del BienEstar Daniela sometimes visits at the weekend. She’s the daughter of Sylvia and has her own place in Burgos but this week she’s been staying here the whole time. Last night she comments how when she is here she feels so much love from Arianna and Joserra, love that she says she doesn't receive elsewhere. I asked Marta, a woman who'd been to two Awakin circles in Casa BienEstar, how she heard about the circles. She says one evening in Burgos she was in her car on her way home and a distressed Daniela knocks on her car window. Daniela says she can’t make her way back and asks if Marta would give her a lift home - to Casa BienEstar. She agrees and Daniela shares with her what’s been happening there. A week later Marta is sitting in silence around a circle of ~30 people in the living room of Casa BienEstar. Marta comments how Daniela was an angel in disguise. Speaking with Natalia, who had just heard about Awakin circles, she shares how she’d been living in Burgos for many years and never knew anything like this existed in the heart of a very conservative community (so I have been told, seems to be shifting quickly!) Funnily she didn't hear about the circles in Burgos, but in Palencia, a nearby city where Sabine recently held the first circle. When Pavi was here, a few of us went for a short stroll with some gifts for pilgrims and a ¿Me regalas un abrazo? (Free hugs!) Passing by a small grocery shop, we held the sign outside the window. The shop lady sees the sign, and even though she is midway serving customers, she jumps out, beaming, and gives us all hugs. She then dashes back in and comes out with beautiful oranges as gifts. Later we bump into Fran on the street, a local love warrior. We chat for a while and then he spontaneously offers to cook lunch for all six of us. After walking around the city a while longer and sneaking in art pieces we made with Colleen into the shoes of pilgrims staying in a hostel, Fran appears with a delicious feast he cooked in record time. We miss you here brother !